The Election Is Over - Now What? On Tuesday night’s Daily Show, host Jon Stewart quipped that the election had been “two years, three billion dollars, and we’re right back where we started.” It’s an oversimplification, to be sure, but not altogether inaccurate; Tuesday’s election resulted in very little net change in the makeup of the House of Representatives or the Senate. Republicans have retained their majority in the House with 233 members to the Democrat’s 194 with eight races still too close to call. The Democrats maintain control of the Senate by a majority of 53-45 (plus two Independent senators). While the balance of power hasn’t shifted much, it’s worth noting that there will be a significant number of new legislators coming to Washington in January. There will be at approximately 75 new members of the House (at least 39 Democrats and 33 Republicans) and 12 new Senators (eight Democrat, three Republican, and one Independent). Some of these legislators are returning to Congress or, like Tammy Baldwin of Wisconsin, moving from the House to the Senate. But that doesn’t change our goal; we’ve got more than 80 legislators who’ll need to be educated on the bevy of issues that affect our children’s health. Early next year we’ll begin a campaign to reach out to these legislators, and we’ll need your help. In addition to the newbies, however, many of our congressional champions will be returning next year. Sen. Bob Casey and Rep. Joe Pitts of Pennsylvania, as well as Rep. Frank Pallone of New Jersey were all re-elected. These legislators were original sponsors of legislation to reauthorize the Children’s Hospital Graduate Medical Education (CHGME) program. Many other champions, such as Sen. Sherrod Brown of Ohio and Sen. Johnny Isakson of Georgia will be returning as well. Of course, President Obama was also re-elected. This all but ensures that the Affordable Care Act isn't going anywhere, and that the major provisions - including coverage of pre-existing conditions and the individual mandate - will be in place in 2014 when they're scheduled to kick in. It also means that health "exchanges" - a health insurance marketplace run by the Federal government, the States, or a combination of both - will move forward. States are required to let the Department of Health and Human Services know by next week if they will set up exchanges before the January 2014 launch. Thus far, 13 states as well as DC have said they will set up exchanges, and roughtly 20-30 states could build them or seek partnerships. We'll keep an eye on implementation as these provisions continue to be rolled out. With the elections behind us, what happens next? The current members of Congress will return next week for a final session to complete outstanding work. This session, colloquially referred to as a “lame duck,” will likely last several weeks, most of which will be taken up with organizing the next (113th) Congress. There is also a HUGE volume of unfinished business from this year, most notably the “fiscal cliff,” a slowdown in the US economy that is expected to take place if certain tax cuts and other laws are allowed to automatically expire or, conversely, go into effect at the end of this year. These automatic spending cuts – sometimes referred to in Washington jargon as sequestrations – will significantly reduce spending levels for government programs and increase income and business tax rates. It’s possible President Obama will release a proposal to combat the slowdown, or that Republicans will push for a temporary extension of all fiscal cliff issues, allowing the next Congress to take it on. Either way, expect this to be the main focus of Congress well into December. In terms of children’s health issues, we’re hopeful Congress will still act on CHGME reauthorization, TRICARE for Kids legislation, and the Pediatric Research Network Act. You’re encouraged to reach out to Congress over the next few weeks and urge them to take on these important issues before adjourning later this year. With All Our Might provides insight into child health policy issues and the impact they have on how health care is delivered to children in the United States. The Children’s Hospital Association advances child health through innovation in the quality, cost and delivery of care. Representing more than 220 children’s hospitals, the Association is the voice of children’s hospitals nationally. The Association champions public policies that enable hospitals to better serve children and is the premier resource for pediatric data and analytics, driving improved clinical and operational performance of member hospitals. 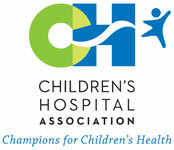 Formed in 2011, Children’s Hospital Association brings together the strengths and talents of three organizations: Child Health Corporation of America (CHCA), National Association of Children’s Hospitals and Related Institutions (NACHRI) and National Association of Children’s Hospitals (N.A.C.H.). The Children’s Hospital Association has offices in Alexandria, VA, and Overland Park, KS. Candid images from N.A.C.H. President & CEO Larry McAndrews of the presidential signing of the health reform bill into law. Candid images of the March 3, 2010 White House event to rally support for Health Reform. The Children's Hospital Association welcomes blog submissions from other child health policy experts, health providers, patients, family members of patients and others who have an intelligent or personal viewpoint on the impact of public policy on children’s health care and other related issues. For more information on how to become a blog contributor, please e-mail mightyblog@nachri.org. The views and opinions expressed in individual, non-Children's Hospital Association staff posts are strictly those of the author(s) and in no way represent those of the Association. The Association assumes no liability for the information therein and extends no implied or expressed warranty or guarantee of accuracy of blog posts submitted by non-Association staff. The receipt of unsolicited ideas by the Association does not obligate the Association to keep these ideas confidential, nor does it obligate the Association to pay the person who submits them.